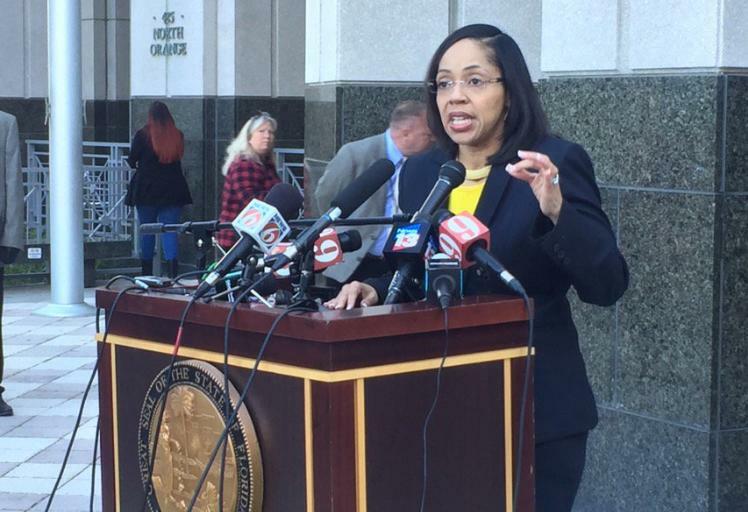 Orange-Osceola State Attorney Aramis Ayala speaks with reporters about her decision to not pursue the death penalty during her administration. Update 4:20 p.m.: Governor Rick Scott has signed off on an executive order stopping Orange-Osceola State Attorney Aramis Ayala from prosecuting Markeith Loyd case. Scott has assigned Fifth Judicial Circuit State Attorney Brad King to the case. The move comes after Aramis refused to recuse herself from the case after declaring she would no longer seek the death penalty in capital cases. Several Central Florida lawmakers and Attorney General Pam Bondi slammed Ayala’s decision for no longer seeking the death penalty, and Clearwater Republican Senator Jack Latvala called on Ayala to step down. Ayala told reporters Thursday that the death penalty delays justice to families due to years of appeals, and that it’s too expensive to house death row inmates in the state’s prisons. Racial justice and anti-death penalty organizations praised Ayala’s decision, but its angered law enforcement groups. Ayala’s move not to pursue the death penalty option in any case follows a new law requiring a unanimous jury recommendation. Original Story: Florida’s Republican leaders are blasting a Central Florida prosecutor’s decision to stop seeking the death penalty. State Attorney Aramis Ayala is prosecuting the case against Markeith Lloyd, the man accused of killing his pregnant girlfriend, a police officer and leading law enforcement on a nine-day manhunt. Orlando member station WMFE reports Ayala says the dealth penalty delays justice for families through years of legal appeals, and that keeping inmates on death row is too expensive. Clearwater Republican Senator Jack Latavala says Aramis didn’t tell voters about her position on the issue in the campaign and should be fired. “I’m very hopeful the Governor will find an alternative and like I say, I think she ought to be thrown out of office," Latvala told reporters. Ayala’s decision not to pursue the death penalty option in any case follows a new law requiring a unanimous jury recommendation. Racial justice groups and death penalty opponents are praising her decision. Racial justice organizations like Color of Change PAC are applauding Ayala’s decision. “[It] sets a powerful example of reform that others must heed. Every day more and more Americans of all races are waking up to realize the warped incentives in our criminal justice system, and in 2016 many went to the polls to vote out prosecutors working from a failed and inhumane playbook,” said Rashad Robinson, a spokesperson for Color of Change PAC.